I'm removing the desktop backgrounds from the site. The links will still be here, but they will open in a new window, emphasizing the idea of it being a seperate site. Before I created this site, I used to continuously search the web for backgrounds for my web pages. I found that alot of times, the free backgrounds being given away at many sites were of poor quality. Some didn't tile too well, others didn't tile at all, and some were just plain ugly. I also had some problems with the free buttons and such from the same sites. 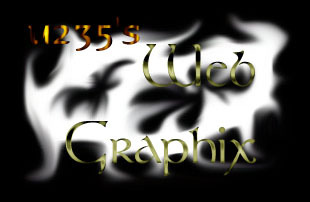 Then I decided to start making my own graphics for my pages. And that's how this site came about. I was making these graphics for my own purposes and thought, "why not share them with the rest of the world?". I did, however, include some backgrounds I've gotten from other sites, ones that I've found tile very well [unfortunately, I've forgotten where I got them, so I can't give credit]. The buttons I all created myself, and though I haven't used them much myself, they were easy [and kinda fun] to make. Anyway, the graphics are all free to use as you see fit, I require nothing for you to use them. However, a link or a freindly email would be nice.